The cake stands are TODAY’S STEAL at Decor Steals! They are really incredible so you will want to check them out! I made a tiered decor piece by stacking the cake stands on top of each other. HERE’S A SG TIP: Make sure to use adhesive putty between the layers to keep the cake plates from moving around or toppling over. I get my adhesive putty at my local craft store. These plates are perfect for stacking!!!! I made a woodland arrangement and used it on our Thanksgiving table! The three pedestals were just the right height for the table. We could see over them easily. I filled each layer with lots of acorns, berries, pinecones, twigs, willow balls and a few deer sheds! 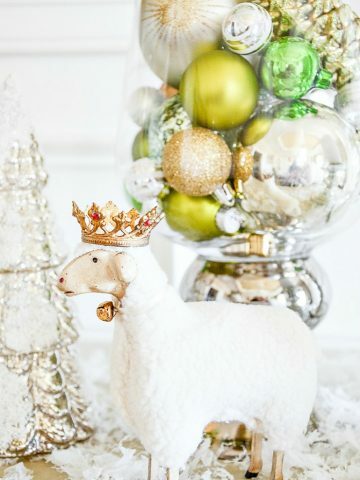 Did you notice the pearly white and silver Christmas balls? 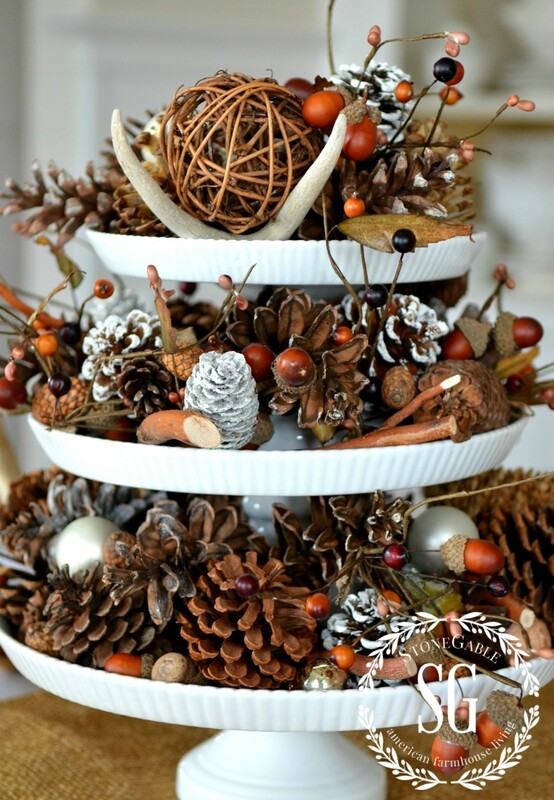 By adding a few greens, this arrangement could go from fall to Christmas decor! So easy! The second design I created was an arrangement for Christmas. I’m loving long, casual pine needles this year! The ribbed edge of the cake pedestals go with every decor! 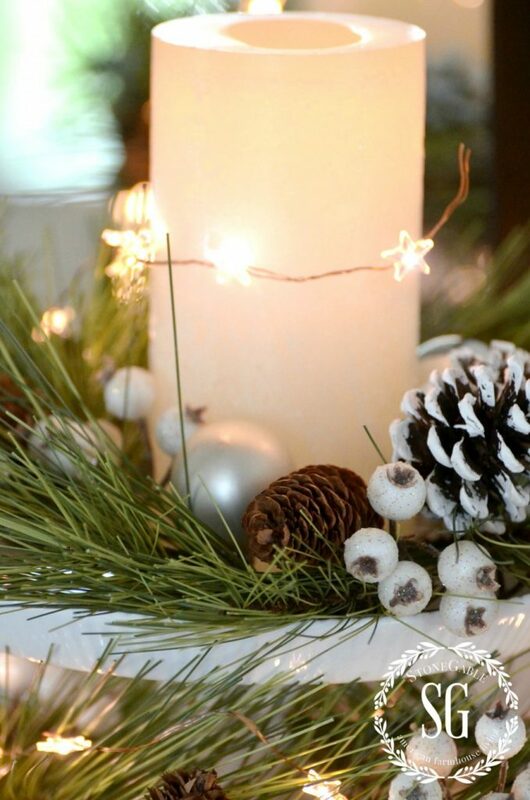 The pine needles are filled with snow coated pinecones, white berries, silver and pearl Christmas balls and darling white star lights. So simple… simply beautiful. At least, I think so! Because the stands were made to go together, they are wonderfully sized! Perfectly proportioned! It was a delight to fill in the tiers with Christmas! This arrangement is topped with a big candle. Lots of sparkle and glow! The last way I used my the DECOR STEALS cake stands was to make a vertical cheese board! This was really fun!!! 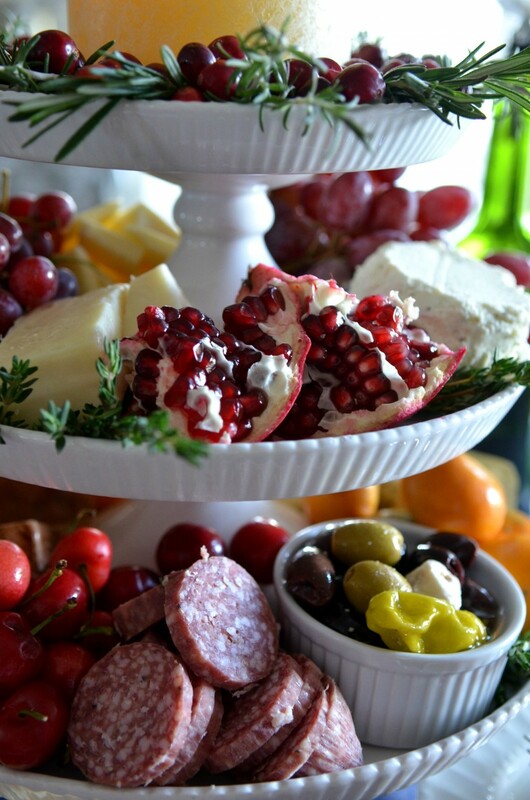 I made sure to add lots of yummy cheeses, colorful fruit, and some great savory cured meats. Who knew that 3 cake stands could make such a great presentation!!! I’ll be using this a whole lot over the holidays! I’ll be sharing the vertical cake stand in detail next week! Lots of scrumptious ideas for you! The top tier of the vertical cheese board held a fat candle surrounded by lots of cranberries and rosemary spring to make a stylized wreath. 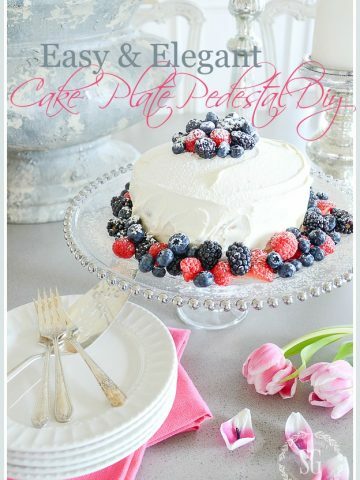 I hope these three ways to use pedestal cake stands have inspired you to try something different with yours and to stop by DECOR STEALS and check out the “steals” they have daily! To make sure I don’t miss the daily steal I get a notice sent to my inbox every day! I’ve gotten lots of great, well priced items that are truly one-of-a-kind bargains! If you would like to sign up to see the fabulous daily steals click HERE. And head over to DECOR STEALS ON FACEBOOK. They are giving away a set of these lovely cake stands to one lucky reader! 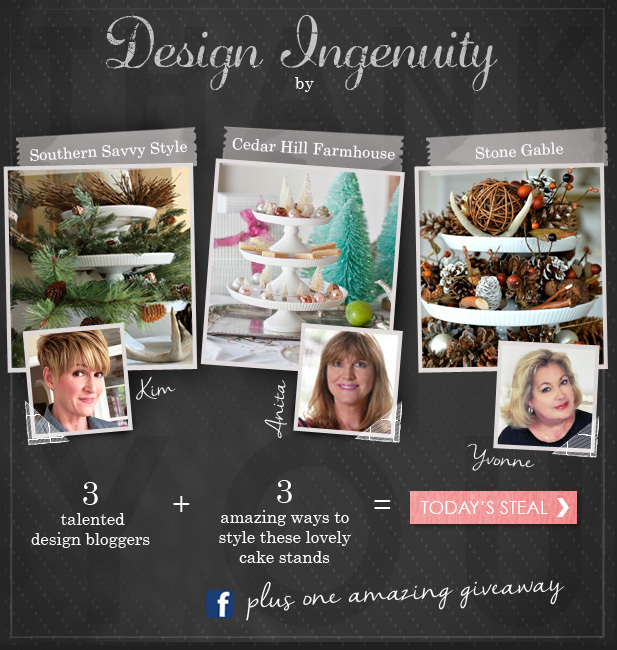 Don’t forget to visit my friends Anita and Kim and see how they used their DECOR STEALS cake stands! Thanks, kind folks at Decor Steals! I love your site and products! You might like to add this to your Pinterest DECOR board. 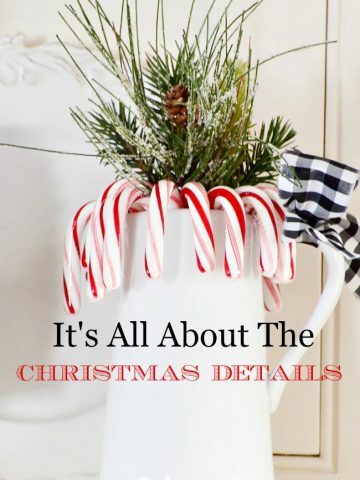 You can follow me on Pinterest HERE and see all the decor things I am pinning… bunches and bunches!!!! 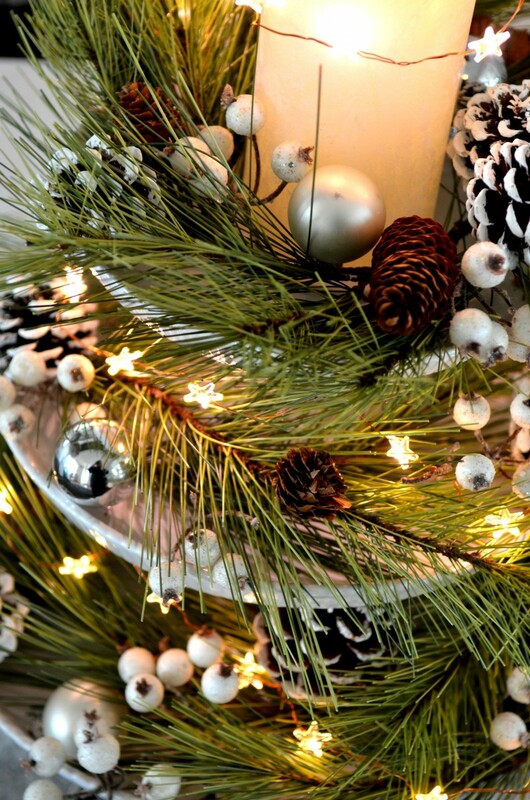 Where do you find good, real looking pine greenery? Always a new way to the items you already have around the house. 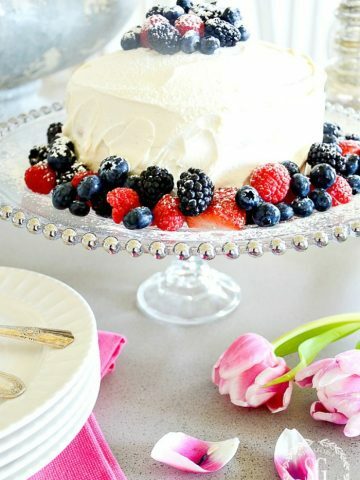 Great ideas for cake stands! Good place to get inspiration on the around the house. So elegant and beautiful! Love this idea. 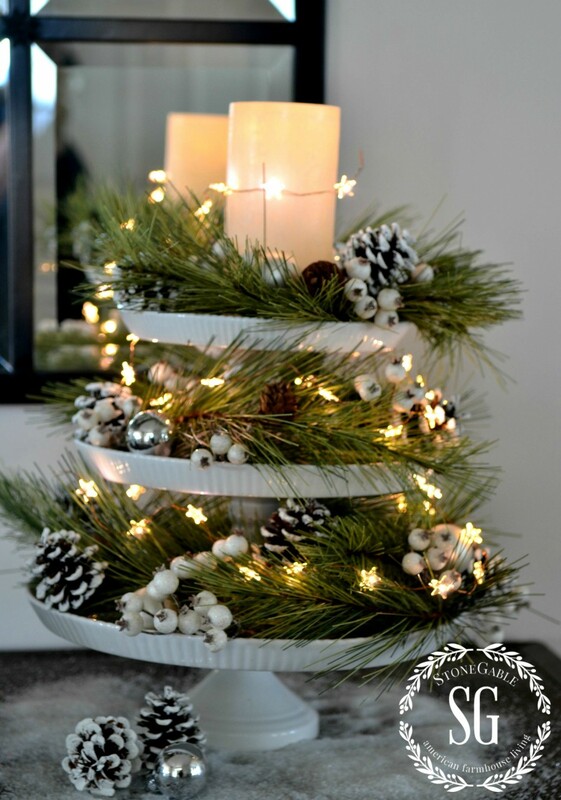 I love how you used these 3 tiered stands Yvonne! Thanks for the inspiration!! I have been looking for antlers for years. Can you tell me where you found yours? They are the missing piece of my Christmas decorations. HI LISA! Welcome to the StoneGable family!!!! I’m so glad you found StoneGable! I get my antlers wherever I can find them. Lately I’ve gotten them at craft/vintage shows. Hope this helps, Lisa! I love the way you used these, very creative and beautiful. Beautiful work. I love how you can incorporate several pieces into one great look. I need to go find some putty to attach my plates together. Thanks for the inspiration! SOOOOOOOOOOOOO creative..just love the italitan antipasto idea…how verstile is this?!!!! Very beautiful, Yvonne! Love the little star lights. They are so cute! The vertical cheese board looks yummy! You are SOOOOOOOOOOOO creative!! I love how you completely changed the cake stands for three completely different looks!! What did you use to adhere the stands together for the cheese “board”!! That is SOOOOOOOOOOO pretty and inviting!! The cake stands would be a welcome addition for so many different things! You have all done such lovely jobs of finding pretty uses for the cake stands. With a large extended family we are always hosting get togethers throughout the year. The stacked stands would really free of valuable table space while still looking nicely displayed. Yvonne, to make those cranberries snack ready, try this recipe: Wash well, let dry and roll first in egg white and then in sugar. Keep them spread out on wax paper until they dry and then they last all season in the refrigerator. I prepare this on a big jelly roll sheet and roll them from one end with egg white, then through the sugar and to the far end to dry. Yummy especially with dark chocolate anything. 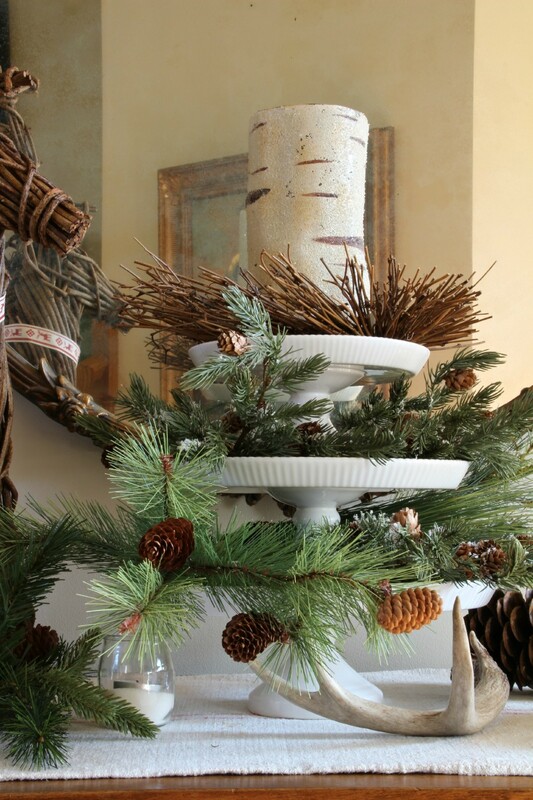 I love these cranberries in the tiered pedestal set. All of your sets look marvelous and are very inspiring. Very pretty!! I am jealous, I would love those (just kidding), You do a fabulous job with putting things together, thank you for sharing them with us. I was just commenting on Kim and Anita’s blog post that the three of you make a great team to come up with great vignettes with these cake stands from Decor Steals. Great and pretty inspiration. I need to dig out my cake stands…and get busy. I love every one of them. Brilliant! Loved those little star lights. Do they have to be plugged in? But my very favorite is the cheese, meat and fruit trays. That is the bomb! Peggy, the little lights are battery operated. Don’t they sparkle? where did you find the cute star lights? These are all wonderful ideas. I really love the vertical cheese board! Such a great creative idea and so beautifully presented! Mouthwatering. Okay, this challenge is genius! I love it! I love all the stands! Great job! Love your creative ideas with the cake stands and thanks for the tip about the puddy between the layers. I love the one that lit up but I would definitely use the layered food stand idea for company…so pretty. I think we could all use a few sets of these after seeing all the ways you designers displayed them. I loved them all Yvonne…especially that last one with the fruit and cheeses and the candle on the top surrounded by cranberries and greens…so pretty! Yvonne, heads up my link is not working! Got the new link from your site so all is good! Now off to see your beautiful vignette! What a great idea. We are having an open house this weekend. I don’t have white ones, but i figure the old trusty clear ones with a lace doily will work! The appetizer idea is wonderful. thanks. Make sure you anchor them together with something!!!! I bet they will be beautiful! It’s gorgeous!! I love your style. I hope we get to do some more events together, I agree we make a great team! Love, love, love your ideas on the cake stands. I especially love the vertical cheese board. It not only looks fantastic and inviting but saves space. You scored big with this one! Thanks so much for sharing your creativity. Vicki, we think alike! Yes,the vertical cheese board will save lots of space!! Thanks for commenting today! hugs! So lovely!! May I ask where you got the string of star lights?? Yvonne, so beautiful, festive and creative! I’m always inspired by your beautiful blog posts. 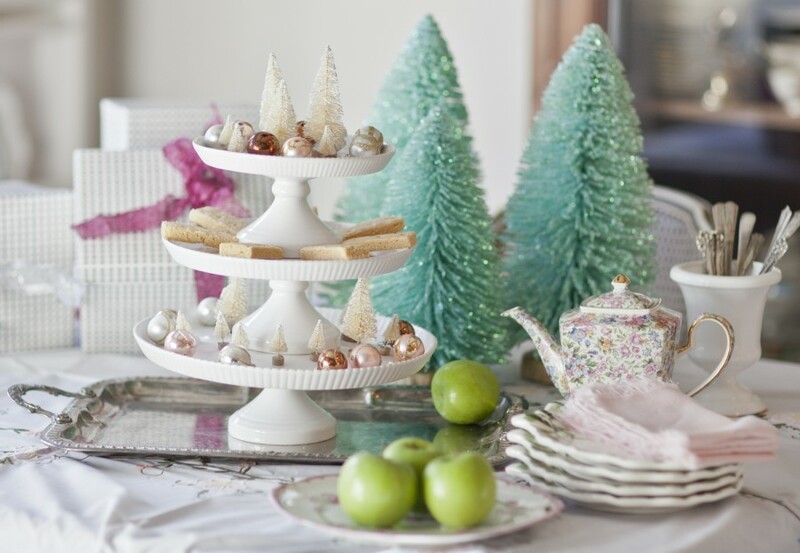 Beautiful cake stands Yvonne…I love using them for things other than cake! !….Thanks for the inspiration! Girl, I love your creative ways and you posted a bit early.